Please join us for an in conversation with artist Antti Laitinen, Elizabeth Neilson, Director of Zabludowicz Collection, and Harri Laakso, a co-curator of the Finnish Pavilion at this year's Venice Biennale. We are very pleased to be presenting MARKO MAETAMM at the 11th edition of LOOP, the first fair devoted exclusively to moving image. BERTILLE BAK's film "Transports a dos d'hommes" has also been selected for The Cinema section of the fair. 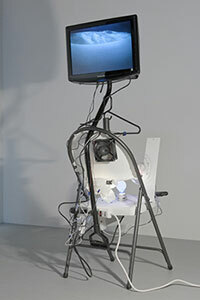 We are very pleased to be presenting Bertille Bak at the 10th edition of Loop, an art fair devoted to videoart.